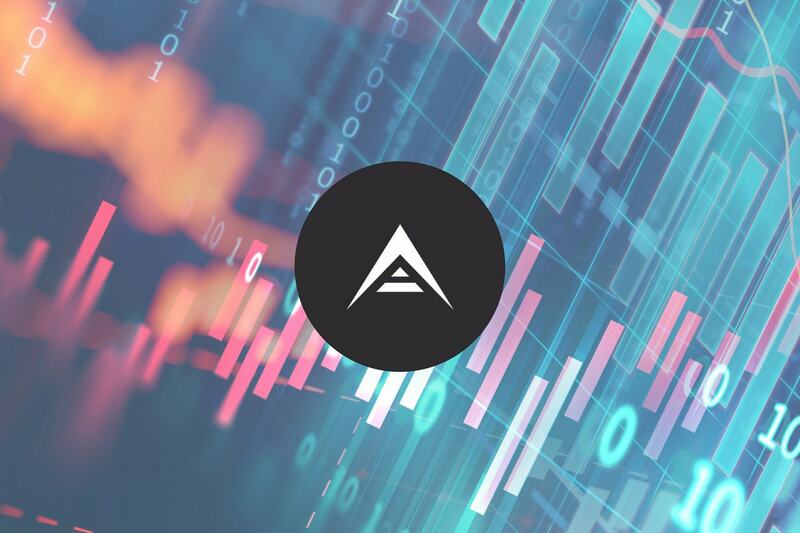 Ark has continued its decline this week, falling a further 10% over the past 24 hours, as prices trade hands at $1.44 at the time of writing. This 10% drop comes after Ark had experienced a previous decline of 5.91% over the past 7 trading days. The 16-month old coin is intended to be accessible to all, allowing users and companies to create their own sandbox ecosystem by creating their own blockchain through the Ark infrastructure. This user-friendly approach to enabling blockchain for companies and users is intended to rapidly increase blockchain adoption. Perhaps one of the most unique features of the Ark ecosystem is the use of “Smart Bridges”. Smart Bridges allow separate chains to be “bridged” through the Ark blockchain, effectively connecting separate blockchains through the Ark blockchain and therefore allowing all the chains to communicate with each other. For a blockchain to be connected to Ark via a smart bridge, the blockchain simply has to add one line of code to their infrastructure provided by the Ark team. For a more in-depth overview regarding Ark, please refer to our “What is Ark” guide. Ark is currently ranked at 67th place in terms of overall market cap across the entire industry, with a total market cap value of $149 million. 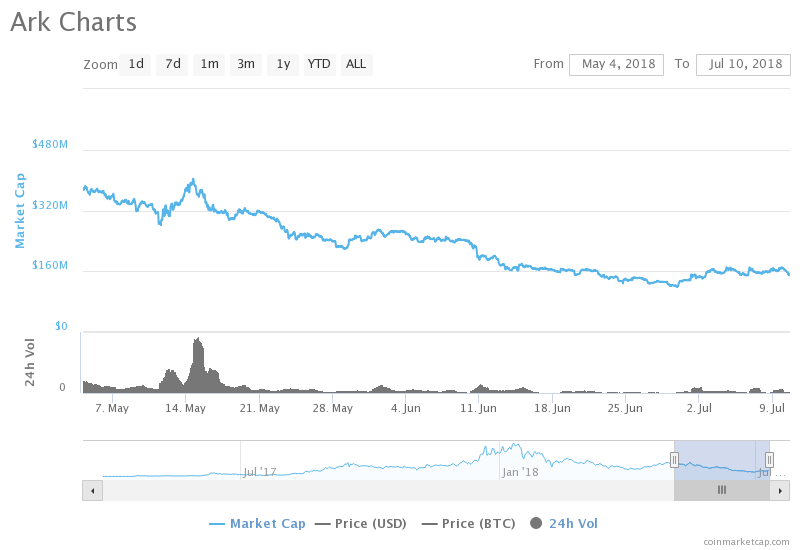 This is $257 million lower than the market cap high seen 2 months ago, as indicated by the graph below, at a value of $406 million on May 14, 2018. Let us continue to analyze Ark’s market action over the course of its trading lifespan. Analyzing the chart from the long-term perspective above, we can see that Ark, like most other coins within the same period, had experienced a major bull run from the months of November 2017 through to January 2018. However, Ark had started its bullish run a few months prior to November 2017 when it rose from a low of $0.30 on July 16, 2017, to an all-time high of $11.41 on January 10, 2018. This was an epic price increase of 4,200% from low to high. After placing this all-time high, price action went on to depreciate substantially. This is understandable as any parabolic market that appreciates drastically in a short period of time is expected to “crash” as no asset continues to rise indefinitely. Price action had originally found support at the .786 Fibonacci Retracement, priced at $2.67, for most of the trading year, occasionally slipping below this level for a brief spell during March and April. This is a Fibonacci Retracement taken from the entire bullish run outlined above. Toward the end of trading during the month of May 2018, the market fell below the .786 Fibonacci Retracement and continued falling until finding support at the .886 Fibonacci Retracement in June, priced at $1.56. However, we can see toward the end of June, price action fell further below the .886 Fibonacci Retracement, falling until it found support at the 1.414 Fibonacci Extension level priced at $1.10. This is a Fibonacci Extension taken from the initial bearish leg seen after the market placed its all-time high to the mid-month low seen on January 17, 2018. The market had found significant support at the 1.414 Fibonacci Extension as it rebounded to where it currently meets resistance at the .886 Fibonacci Retracement. It is pertinent to note that the market is currently trading at price levels not seen for over 11 months now. Let us analyze the market a little closer to highlight any potential support or resistance areas that price action will likely meet. Analyzing the market from a closer perspective, we can see that the market has experienced a rough previous 2 months. We can see that the market appreciated during the month of April, rising from a low of $1.77 on April 1 and rising to a high of $4.02 on May 3. However, as May continued trading, the market rolled over and continued to fall throughout June until reaching the low seen at $1.09 on June 29. As the market rebounded from $1.09, we can see that it met strong resistance at the long-term .886 Fibonacci Retracement priced at $1.56. Price action failed to break above the .886 Fibonacci Retracement, and has recently been rejected by this level over the past trading session. If the recent bearish action seen over the past 24 hours continues to drive prices lower, then the nearest level of support can be found at the June low of $1.09. This level has provided ample support recently and is expected to continue to hold the market above the $1 handle. If the bears manage to step back into the market and push prices back above the .886 Fibonacci Retracement, then the nearest level of resistance comes in at the bearish .382 Fibonacci Retracement (marked in red), priced at $2.27. This is a Fibonacci Retracement taken from the recent bearish swings seen over the past 2 trading months, from a high of $4.17 on May 14, to a low of $1.09 seen on June 19. 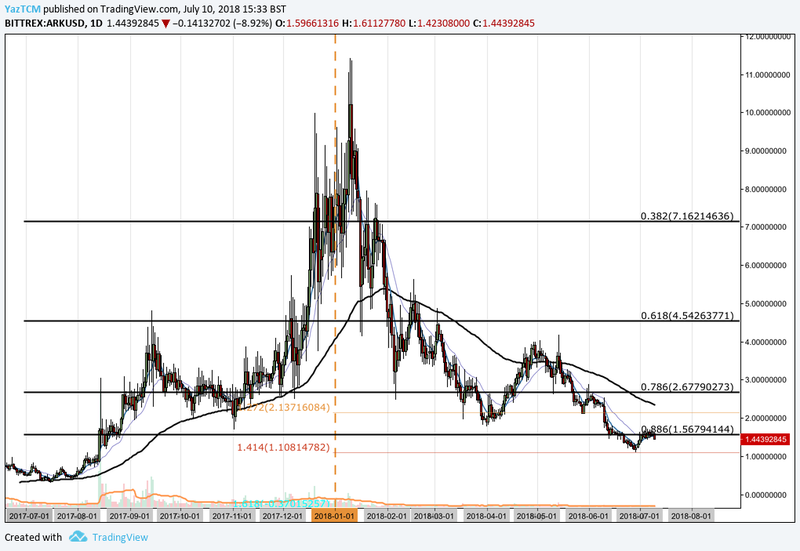 Further resistance beyond this level comes at $2.67 which is the long-term .786 Fibonacci Retracement (marked in black). The technical indicators within the market are currently leaning toward the favor of the bears. The RSI has recently dropped back below the 50 handle indicating that the bearish momentum has once again taken over. The RSI had managed to break above the 50 handle during the start of July but failed to continue to appreciate as the bears stepped in. If we would like to see the market stopping its decline, we need the RSI to break above 50 and head near overbought conditions at the 80 handle, indicating that strong bullish momentum would be in play. Similarly, the moving averages are leaning slightly toward favoring the bears within the market. The 7-day EMA (blue line) had recently made its way toward the 21-day EMA (purple line), positioning itself for a bullish crossover. However, the bullish crossover of the moving averages did not occur and the 7-day EMA has instead shifted away from the 21-day EMA, indicating that bearish pressure is once again increasing. If we would like to see this market appreciate, then we would want to see the 7-day EMA cross above the 21-day moving average to signal the start of a potential bullish run. 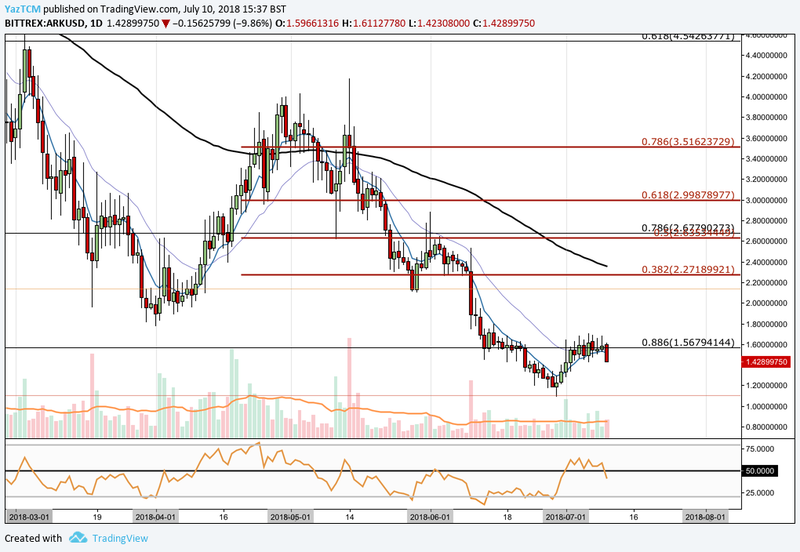 The entire cryptocurrency market is in a bearish period right now and Ark has succumbed to the bearish pressure falling around 85% from its all-time high. However, the future still looks bright as Ark continue to develop their recently released Ark Core v2, which was written from scratch to allow for faster transaction speeds and a higher degree of scalability. When this is launched to the mainnet, this will provide ample positive sentiment for the Ark ecosystem. We will be closely monitoring development updates from the Ark Crew as this bearish decline, hopefully, starts to come to a close.